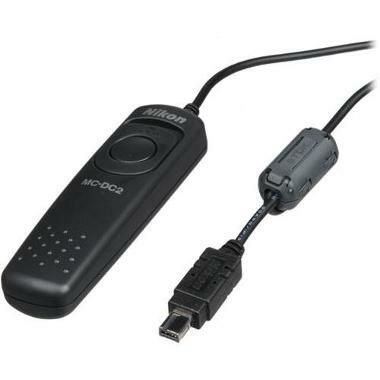 The Nikon MC-DC2 Remote Release Cord is a simple wired release cable for many non-pro body (i.e. without built-in battery grip) DSLR and point-and-shoot Nikon cameras. It has a 3' cord, half-press focus capability, and locks to help to keep the camera shutter in Bulb mode. It is ideal for long exposures and macro shooting. If you don't see your model on this list, you may instead have a 10-pin plug (common on pro body/built-in battery grip models) or the older, smaller MC-DC1 plug. Check your manual to see what accessory ports your Nikon has.